Preparations are well underway for Carnival Fever 2016! We’ve now filled our service team places, so if you missed out on applying, don’t forget you can still come as a participant. All you need is a sleeping tent, as all food and drinks are included in the ticket price for the whole weekend. Bookings are still open until the end of May, so don’t miss out on this fantastic way to celebrate the Spectacular year! We’re delighted to announce we will be welcoming our new Chief Guide, Valerie Le Vaillant, to officially open the weekend and spread the carnival fever. 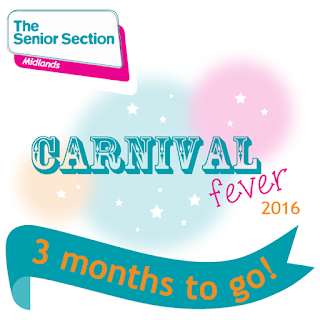 Valerie will be joining participants to celebrate The Senior Section Spectacular in style. We’ve got loads of great activities lined up so far for the weekend, and don’t forget that you have two adventurous activities included in your ticket price. For those of you who aren’t familiar with Blackwell Adventure, it’s the perfect setting for us to get our samba celebrations going. Originally a country house estate, the site is now a vibrant activity centre. Whether you are getting hoisted up ready to drop on the 3G swing, scaling the vertical obstacle course or gliding through the air on the 240m long zip wire, you’ll be able to discover your adventurous side during the weekend celebrations. As well as adventurous activities, we’re also welcoming Garry Jones from Off Our Trolley Arts, who will be helping us construct our very own spectacular carnival float with a series of hands-on workshops. There will also be a chance to make something for our carnival party. You can check out some of Garry’s amazing work on the Off Our Trolley Arts website. If you need to put your feet up and take some well-earned ‘me-time’, you can experience our pamper zone and movie screenings, which will be running throughout the weekend. You can also relax on the Copacabana ‘beach’ with a refreshing tropical drink. Don’t forget that you don’t have to be a member of a Senior Section unit to enjoy Carnival Fever – if you’re a member of Girlguiding and aged 14-25 in August 2016, then the celebration is for you.